If you listen to your local, national public radio station, you’re probably familiar with The Moth. Specifically, The Moth radio hour, an hour worth of curated stories from people’s lives that entertain and inform us all about life and the human condition. Each story is a true story from the storyteller’s life and what they share can be humorous, emotional, heartfelt, but basically always leaves you feeling a little more connected to humanity than you did before – or at least it does for me. I love listening to people’s stories. I love connection. So I really love The Moth. 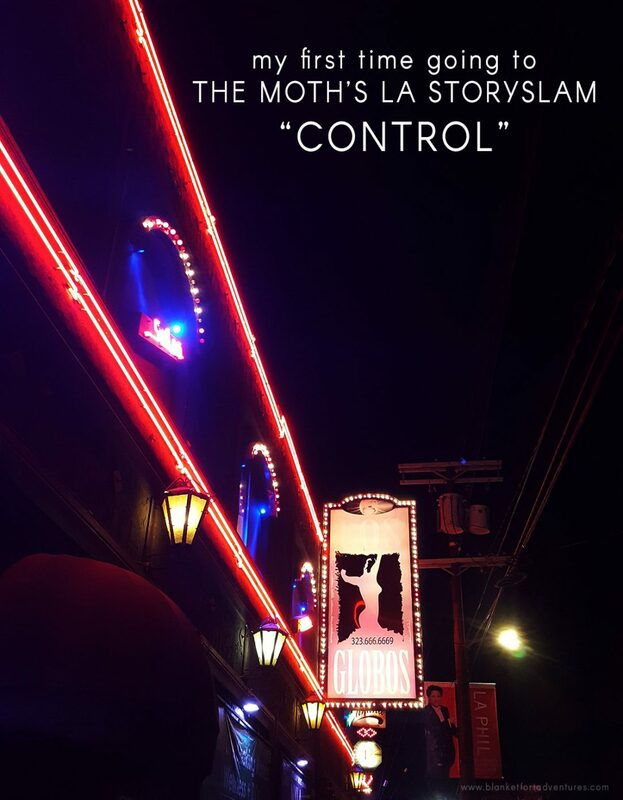 I’ve fantasized about being on The Moth radio hour, but it’s a long road to get there, and it starts with StorySlams. The Moth hosts StorySlams in various cities across the country that are centered around a specific theme. Storytellers then coming to the event put their name in the proverbial hat and destiny decides whether they will share that story or not. 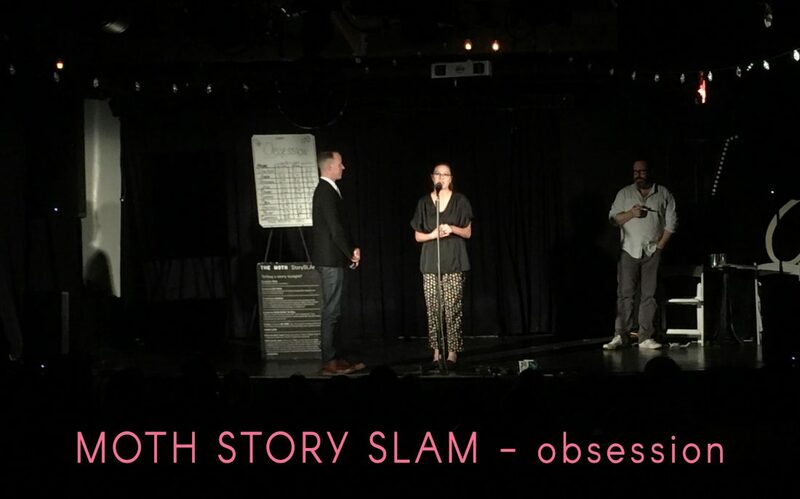 Each story is judged by random people in the audience, and the winner of the night goes onto a GrandSlam where they compete against other StorySlam winners. The stories that get onto The Moth Radio Hour are curated from the Moth Mainstage, which is another level of The Moth that I assume one gets to by winning a GrandSlam. It’s a journey, and one I am ready to embark on. I’ve been called an oversharer. I definitely identify as being a writer. So why not! Last night I attended my first Moth StorySlam. I crafted a story around the topic of control, and then decided it wasn’t good enough to perform – so I just went to observe. Since I was a newbie, I felt just getting a lay of the land would be good and I’m so glad I gave myself the grace to try and then know when I may be out of my realm. Well, after listening to fabulous stories, and not so great presenters of stories, and stories that weren’t even on topic – I have COMPLETE confidence that anything I write is worthy of my name in the hat. And really, I can only get better with each try. So I’m going to keep on trying. When you attend a StorySlam, slips of paper with a question around the topic is on the chairs, and people can write a two sentence story around the topic to toss into a box. Last night the topic was “Control, ” and the question was, “When was there a time you felt you had lost control.” I wrote four sentences that outline the story I’m going to share below. The host read my slip of paper, the audience laughed, and she ended by saying, “That’s not a two sentence story, that’s an existential crisis.” I loved it. But her saying it was an existential crisis was sort of the reason my instincts said to not share my story because it didn’t feel like a story, it felt more like an essay. 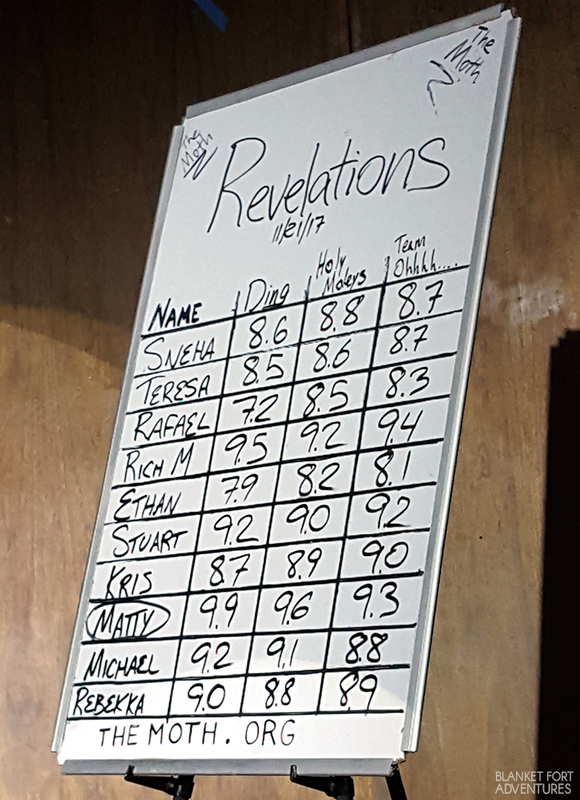 Later in the evening, Dan and I ran into a few of the people who were also at the StorySlam, and I had confessed which slip of paper was mine. They burst into laughter and astonishment in being able to relate to my life existential crisis and encouraged me to share my stories – because it seemed like I could tell a good one.